One day last week as every morning I was going to connect to facebook and update my travel page, but I wasn’t able to do that. 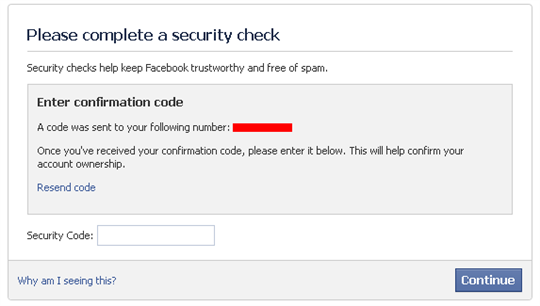 I got message asking to enter security code, which was sent to phone number XXXXXXX. I was looking to that phone number and for a second couldn’t understand that is this and why it sending something to it because I have totally different phone number. After some thought I remembered what is this. It did happen exactly a year ago and for some reason I entered my cell phone number I had at that moment because Facebook asked it for some reasons. Of course I could easy to skip that step, but I didn’t, as I didn’t think about circumstances. The phone number was temporary. During my trips I often buy prepaid phone SIM card in the country I am staying for a week or longer as it much cheaper to make local phone calls or send messages. Some weeks later my trip was over I trough away my temporary SIM card as I didn’t need it any more and forgot I entered that number somewhere on the web. But that SIM card would be useless even if I would have it with me now because the phone number expires after awhile if account is not recharged. Please attach a copy of one government-issued ID (ex: driver’s license or passport) or two documents from a respected institution or business. Together these documents must show your full name, photo, and date of birth. Note that we won’t be able to assist you until we receive the proper documents. It looks like everything should be ok, but… It is not in my case. I have a little paranoia about storing my personal information on internet. Thought it is against facebook rules, but I never provide my full personal details for such sites especially because they tend to change privacy rules quite often and you never know what will be available for public tomorrow. Even in this case, because I didn’t provide my full name I can’t access my account and it means I have no access to any data I entered. I didn’t lose a lot because of my paranoia there are no personal data there. I can create another account and find all my friends again. It will take time, but it is not a big lost, as my primary communication is email and I can be totally offline during my travels as I commented on Lis’s travel blog. But…if you are addicted to social networks like Facebook you should make sure all your contact information – cell phone numbers, emails are up to date in case you’ll get the message I got from Facebook about security check. 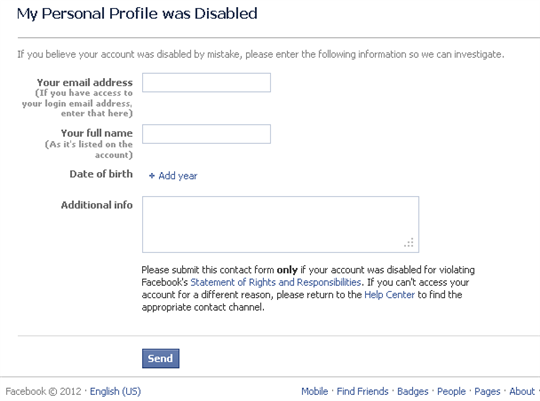 Of course you can send all required information and get your account restored, but it works only if you have your full name provided to Facebook. For other people who are using their nick names instead of real name it can be nightmare. Especially if somebody is using FB as only communication way to reach friends and family. It is hard to image when you want contact somebody, but you can’t reach person because don’t have access to your account and can’t see contact details of that person. It was interesting lesson for me and at the end I did lost something. The biggest lost of this story I can’t access my FB pages any more and need to create if from scratch. Here is my new page. Please take a visit and like it. Oh yeah I remember facebook being a bit stroppy the last time I took a long trip – thanks for the reminder – I am putting some effort into my Facebook page – but only because I dislike it less than twitter! All this situation also was reminder don’t use facebook account login to connect with other websites like pinterest or etc. This happened to me last December. I did have my correct phone number in my profile, but the computer I was using (pay by the minute type) did not have phone reception in the area. So I had to log off, go outside, wait for reception to kick in…get the code, go back in and start all over again…. At least I did not lose my profile completely. I am wondering if maybe Facebook should allow you to report upcoming travel, similar to credit card companies. This way people will not have this issue. That’s why I am not entering my phone as you never know will your cell phone will work in another country.